I know, I know. Many people have already created a conversion to SpellJammer in 5e. There’s Nerdarchy, the WorstDM, and the D&D wiki. What I want to see is what Mike Mearls and the crew at WOTC come up with. As a person that likes older games, it may seem odd that I want it in 5e. I think I really want to see the art. Selfishly, I’ve also found that I can retro anything 5e back to The Black Hack fairly easily. I don’t know why. I own this issue of Polyhedron, but it seemed to change everything too much. The Storykeepers were cool, but the whole effort felt off somehow. I promise that it wasn’t due to the missing space hamsters. The reason was that Spelljammer was no longer the void that connected all the game worlds. It was its own setting. Each race had its own planet. ( Granted, I thought it was very clever in how certain races developed their outlook on life.) There was no mention of the crystal spheres. Maybe the reason was that I wasn’t a true d20 player that was comfortable with feats and prestige classes. Anything that said “requires x feat” would make my eyes glaze over. James Spahn once told me that he created White Star because of his love for Spelljammer. I love White Star and had a group for several months chasing ancient aliens, strange AIs, and a ship named Beyonce. I made my own classes based on Dune, the Fifth Element and the Algebraist. A great game that is loads of fun. I even introduced a friend to RPGs through White Star. White Star, however, is straight-up space opera. Try as I might, I couldn’t get it to be anything like Spelljammer. It shouldn’t have been that hard, but I couldn’t separate the implied setting from the game. (My shortcoming, not James’). 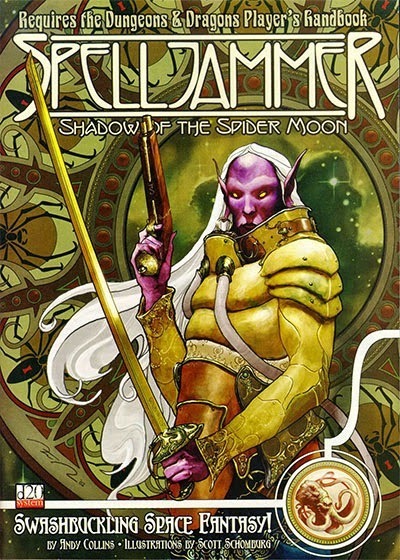 Returning to my central theme, what I want to see published is something like Calidar and Wyrmstone, with the interconnectedness of Spelljammer. Throw in a dash of Space 1889, too. Do You Have Enough Links? What if there were magical and non-magical ways to fly in fantasy space? Let’s just say that there are areas of the void where magic works normally, magic doesn’t work at all, and magic works unreliably. Resources in a non-magic area would be highly prized in magical areas because their ships couldn’t reach it. Although non-magical ships can travel anywhere, magical ships have the overwhelming advantage of increasing velocity near-instantly. This keeps force in the different areas from attacking each other in their respective homeworlds. With a variety of different ships and means of travel, our adventurers would be famous for using many of them. Bear with me, I’m getting to it. What I really want to see published is a rule light-ish system that feels like Spelljammer. Rules light means that you don’t worry about facing in ship combat. Rules light-ish means that there are player options that are just a bit fiddly. Making a ship would be similar to the steps in this post that balance cost, mass, and thrust to make a ship. I’d have to include rules for solar sails. Combat would be similar to White Star, which is to say similar to personal combat. If someone were to use, say the Black Hack, combat could be the same as both use damage reduction to represent the affect of using shields. Classes would include the standard fantasy ones, plus a couple different pilot types. The ships would not be allowed to be any form of galleon or Ship of the Line. Dragon Skeletons, sounds great. Ancient tree with a massive crystalline heart, bring it on. Small wooden diamond-shaped ship that explores the outer reaches of known worlds, awesome. More than that, though, there would need to be the Crystalline Spheres or something similar. There would need to be settings to connect. Maybe Basic Fantasy’s Glain Campaign? Dolemwood? The world of Slumbering Ursine Dunes? (You gotta have space bears.) Anomalous Subsurface Environment? Maybe I just near the potential to go to these places. After all, that is what Spelljammer really represented for me. The players never went to my Space 1889 sphere or my John Carpenter of Mars sphere or my Battletech sphere. They did make it to one of my fantasy worlds along with Dragonlance, Greyhawk, and the Forgotten Realms. This leads me back to 5e Spelljammer. Maybe the reason it won’t work right now is that there is only the Forgotten Realms right now. Without a 5e Greyhawk, Eberron, Dragonlance, or other world, a 5e Spelljammer would be missing the most important thing. The only way to truly escape to another place. Carl Sandburg mentioned iron thoughts in one of his poems. Mine come when the insomnia wears out the part of me that second guesses my ideas. Spread ten points across three attributes, Brawn, Finesse, Acumen. If you are a Wizard, set your Magic stat as 1. The secondary stats are Health and Mana. Health is calculated by (2*Highest Stat)+2nd Highest Stat+Magic. Mana is calculated by your Magic stat + 2. Draw a card from the deck and mark it on your character sheet. This is your chi or whatever you wish to call it. For non-magic actions, roll 2d6+associated stat. If the result is 10 or more, the character succeeds! If not, mark a tally under the associated stat. Once the tally marks equal 4 + stat, increase the stat by 1 and erase the tally marks. For Magic, draw a card and add your magic stat to the rank of the card. Then consult the table below. The first item that applies is your result. If you draw your chi card, the spell is a success. If you draw a card that equals your chi card's rank, the spell is a success, but deduct the spell's Magic Rating from your Mana. If you draw a card that matches your chi card's suit, the spell is a failure, but do not deduct Mana. If you the drawn card's rank + Magic stat is 10 or more, the spell is a success. If you draw a face card, the spell is a success. All other results, the spell fails and deduct the spell's magic rating from your Mana. That was a week ago. Since then, I realized that I could add other special abilities with a fourth stat and a resource pool to manage it. The ideas started flowing. Yesterday, Eric Nieudan happens upon this post and decides to build his own dungeon generator with 2d6 plus a deck of cards. I read over it and instantly love it. So, I did what any self-respecting geek would do, I made a spreadsheet of it for testing. After testing it, I offered some suggestions that tested out well. I'll post a link to the corrected system when it comes available. The iron thought that will not escape me is that I need to finish this game somehow. In addition to the Wizard character that uses magic, I have a psionic character, a priest character, a thief character, a martial character, and a few more. With Jens D and Eric Nieudan to start the idea, I have something for the referee's section of the game. This needs to be made and I can't sleep for thinking about it. More to come on this and other game stuff in progress. this is hard to watch. Wildspace the live action sounds too close to my high school group's Spelljammer campaign. Hopefully a more useful post tomorrow.